Parents, teachers and educators can now present the knowledge using these vividly presented short ppt presentations. Simply let the kids watch and learn. Quizzes are designed around the topics of addition, subtraction, geometry, shapes, position, fractions, multiplication, division, arithmetic, algebra etc. Access the materials by looking at topics - Addition, Subtraction, Multiplication, Geometry, fractions,Trigonometry, algebra, Decimals, Division and more. Math games include among others : memory games, Walk the plank, Fling the Teacher, En Garde Duel, Basketball Game, Penalty Shoot, snakes and ladders math games, puzzles, board math games, and more. Math Games, Board Games, PDF Prints & Interactive Math Fun Games for Children. 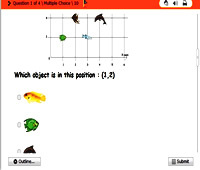 These mathematics interactive math exercises are suitable for kids and young children and range from multiple choice math quizzes, gap fill quizzes, matching exercises, hotspot quizzes with graphics and more for interactive math practice. These are also made more interesting through coolmath fun games. Snakes and ladders mathematics games for children are quite interesting and interactive. They have multiple choice questions and a playing board. You just need to answer a question correctly to be able to roll the dice. This memory math game is highly interactive. The top windows on this game contain questions which need to be clicked and matched with the correct anwers on the windows below. In this walk the plank math game, children are expected to answer all the multiple choice questions to be able to push the intruder off the boat. If you do not get all the questions right, the intruder could get on teh boat. It is a very stimulating game. In basket ball games you are expected to answer a correct question to have teh chance to shoot a hoop. This math game, like the other can be played alone or by two competitors. The winner is usually the person who gets most questions right.